Discussion in 'B4R Tutorials' started by Erel, Apr 12, 2016. This is a small B4J program that uses jSerial library to connect to an Arduino board. 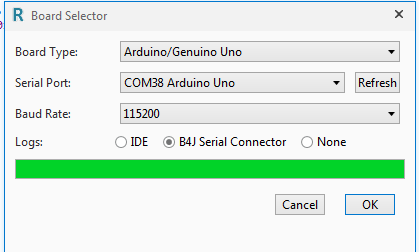 Starting with v1.10 of the serial connector and B4J v1.00 beta 8, the IDE can control the serial connector. 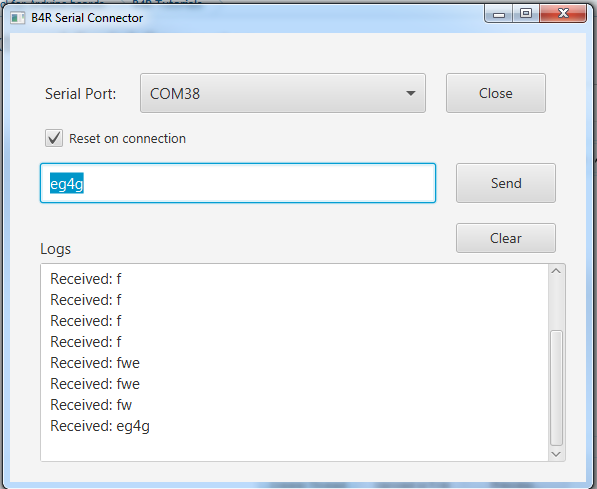 In this mode the IDE will send a message to the serial connector to close the serial port during compilation and to open it afterward. You can modify the code to send binary data instead of strings. Theera, Peter Simpson, Wal and 1 other person like this. With this we can use an arduino as a USB device and comunicate with a B4j app, right? is like hyperterminal for direct serial communication, gateway only or virtual communication port as VSPD(virtual serial port driver)? It is similar to a hyper-terminal. Can we have a block diagram of the system so we can see the different components? 1. The B4R program that uses AsyncStreams to read and write to the serial port. 2. The B4J desktop program that allows sending data over the serial port. Try it. Run the B4R program and the B4J program. Version 1.10 was uploaded to the first post. Starting from B4R v1.00 beta 8 the IDE can control the serial connector so it is no longer required to stop the serial connector before compilation. See the two links at the end of the first post. I had copied j... library files to the B4R libraries. Unchecking them in the library manager the program compiles. By the way, I have several j... lib files in the B4R folder. Must they all be removed? All of B4R libraries start with r. Any other XML file should be deleted. See the instructions in the first post. Make sure to copy it to the internal libraries folder. I removed all refs to network objects and removed jNetwork. It worked fine. Was this console made for something else initially? The UDPSocket allows the IDE to control the serial connector. See the first post. It wasn't mentioned why. Thanks.